If you have ever been to Hong Kong, you will know that there are not just people and buildings everywhere, but also plenty of good food to be found. In fact, fantastic fresh food is so prized in the city that they have a serious problem with food waste: apparently up to 40% of food there goes uneaten, and most of it ends up in the landfill. A typical streetside snack in Hong Kong is the eggette, or gai daan jai (鷄蛋仔, "little eggs"), basically a waffle which is shaped like a honeycomb pattern of oval balls. You can find it for sale in many places, but the only ones I have purchased which have been consistently fresh and crispy on the outside, with the centre variously hollow or soft and chewy, have been at a hole-in-the-wall vendor called Lee Keung Kee (利強記). Often hollow with just a bit of dough on the inside, the best ones are served hot and crispy. Although this shop now has eleven branches, I have only tried the one in North Point, which I assume is where the business became famous, since it's also known as "that place in North Point". Stalls that sell eggettes invariably also sell a waffle which looks much like what you would get here. Known as gaak jai beng (格仔餅, "grid-patterned biscuit"), the difference is that this waffle (which is not really crunchy like the eggettes) is served folded in half with the delicious sauces of butter, peanut butter, condensed milk and sugar. The only problem I have with it is that it is impossible to eat without the sauces dripping everywhere! Hong Kong style waffle, opened up to reveal the sauces inside. Paper bag with LKK branch addresses. Queue outside LKK. You purchase the waffles through the little window hiding amongst all the newspaper clippings. I have mentioned egg rolls, or daan guen (蛋捲, "egg roll"), from Duck Shing Ho (德成號) in my blog before, but had not actually planned to buy them until someone reminded me again. Apparently, once upon a time, you could just walk into the shop and buy your crispy delights, but these days, they are so popular that you have to queue. Crispy butter egg roll from Duck Shing Ho. We ended up visiting the shop three times to make a purchase. The first time we turned up, it was a Sunday, and they were shut. The next time, we turned up too late. The business was still open, but all the boxes I saw inside were already pre-sold to other buyers. Finally, we turned up at 9:30am as instructed (though some recommend coming at 9am), and joined the already long queue. Unfortunately, they did not have any more tins of the coconut flavoured egg rolls, but I did get to try the original and butter versions. I preferred the latter, which were more golden in colour than the pale original egg rolls, as well as crumblier and, well, more buttery. Yum! Attempt #3: queueing in the morning, 25 minutes in. By the way, the queue on the left is for payment, while the queue on the right is for collection. I didn't realise until I got to the front of the payment queue that there is a restriction of 4lbs per person. What that means is that unless you turn up with a friend, you are only allowed four of the smaller 454g tins. Makes it fairer on the people at the back of the line, I guess. Finally, I get to collect my tins of egg rolls! I was surprised to see that the butter egg rolls were only made of "fresh eggs, sugar, flour (cereals containing gluten), butter". No secret ingredient like the vanilla essence in the recipe I tried (or perhaps just conveniently omitted?). There are no preservatives and the tin is not sealed—lift the lid and all you see is a sheet of waxed paper before you get to the crispy rolls. I guess that the success of making these, as with eggettes, is highly dependent on technique. 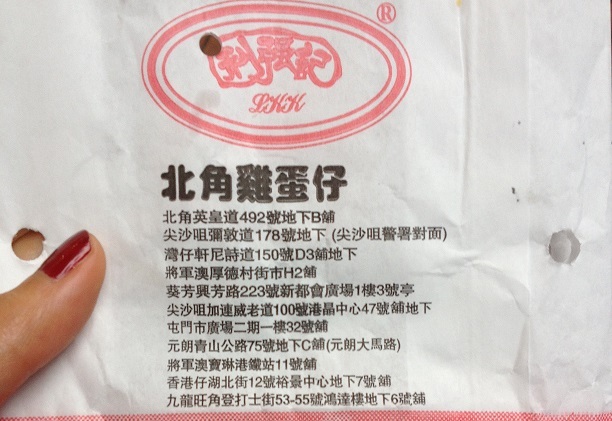 [Added 3 June 2013: By contrast, the egg rolls produced in mainland China under the October Fifth Bakery Macau brand not only come in vacuum-sealed packages (the 150g box I bought had five packets containing two egg rolls each, as well as a packet of desiccant), but also lists the following ingredients: wheat flour, sugar, egg, margarine [tallow, palm oil, soybean oil, salt, milk powder, emulsifier (E222, E471, E477), flavour, antioxidant (E320, E307), colour (E160a)], lard [contains antioxidant (E320, E321)], raising agent [E500(ii), E450(i), E341(i)], flour treatment agent (E928)!